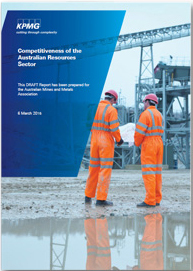 This significant KPMG research report analyses the impacts of Australia’s workplace relations system on labour productivity and investment in the resource sector. It estimates that if the key workplace reforms advocated by AMMA were fully implemented, they could collectively support resource sector productivity growth of up to 5% and investment of up to 8%. This would grow national GDP by 2% and employment by 0.3%, or in real numbers create up to 36,000 additional jobs and grow Australia’s economy by up to $30.9 billion in value. This KPMG research was commissioned by AMMA and involved the input of many of our members. It provided strong evidence for AMMA’s comprehensive submission to the Productivity Commission’s wide-ranging review of Australia’s workplace laws in 2015.